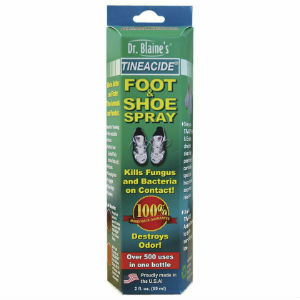 Welcome to our review on Dr. Blaine’s Tineacide Anti-fungal Foot and Shoe Spray. This anti-fungal treatment utilizes a dual action method for treating athlete’s foot and other fungal foot infections while also assisting in preventing the infection from returning. If you are interested in learning about the effectiveness of this product you can read our in-depth review below. Undecylenic acid is one of the primary ingredients in all anti-fungal treatment products today. Tineacide Anti-fungal Foot and Shoe Spray contains it as its primary and only compound which increases the strength of this anti-fungal product significantly. The application of Tineacide Anti-fungal Foot and Shoe Spray should be done two times per day, once in the morning and once at night. Remember to clean the affected area before applying the spray. This product can also be used to disinfect shoes and any type of athletic gear that you use. It claims to eliminate 99.99% of bacteria and fungi with just one spray. Be sure to only apply a small amount on the skin as excessive use may cause your skin to be agitated. As this product only uses undecylenic acid which is quite powerful, it has a high chance of causing stinging sensations for some individuals. This compound is mostly used as a disinfectant and while it is effective, it can be harmful when exposed to highly sensitive skin. Tineacide Anti-fungal Foot and Shoe Spray is available with a price tag of $19.99 for each 59 ml. bottle. Each will usually last for up to a month of use which is about the same amount of time it takes to notice results. You can purchase this product from its official website or other popular online retail stores as well as several pharmacies. The official website states a 100% money back guarantee for any purchase. However, international shipping is not included in this policy. If you wish to make a return you will need to contact their customer support service and ask for a return authorization form, which you will then need to fill out. The Tineacide Anti-fungal Foot and Shoe Spray does have several positive customer feedbacks and appears to be quite effective. It is also reasonably priced which adds to its strengths. That being said, there are also a handful of complaints about it being ineffective and others claiming it caused some unwanted side effects. This is why it is vital to always consult your doctor before trying any sort of treatment. It should also be noted that this product can cause health complications if you breathe it in, something the product’s packaging does not state. Jimmy Rodriguez	reviewed Dr. Blaine’s Tineacide Anti-fungal Foot and Shoe Spray	on November 19th	 and gave it a rating of 3.